When Hester Thrale was thirty-five years old, her husband Henry Thrale gave her a set of six handsome quarto blank books, bound in undressed calf, each bearing on its cover a red label stamped in gold with the title Thraliana. This took place in 1776, a few weeks before their thirteenth wedding anniversary. It is many Years since Doctor Samuel Johnson advised me to get a little Book, and write in it all the little Anecdotes which might come to my Knowledge, all the Observations I might make or hear, all the Verses never likely to be published, and in fine ev'ry thing which struck me at the Time. I suppose you are pretty diligent at the Thraliana, and a very curious collection posterity will find it. I talk now of nothing but French Literature--these Anas have seized me so. She quotes them frequently through all the volumes of the Thraliana, and, with the assistance of her friend Seward1, she formed a collection of them amounting to thirty-one titles. When Hester began writing the Thraliana she had no real English precedent. Although French literature 'swarmed' with examples, there was, as she later said, nothing analogous in English but Selden's Table Talk and William Camden and his published Remains. Joseph Spence, to be sure, had already collected his 'Anecdotes', which she examined in manuscript in May 1778, when Dr. Johnson had the loan of them from the Duke of Newcastle2, but these were unknown to her when she began. The English commonplace-book was still to be met with in Hester's day, although its vogue was already going out, but its character was distinct from the Ana, being a collection of pious or beautiful quotations, rather than anecdotes of living people and treasures of wit. This dearth of systematic collections of anecdote is strange in a century already disposed to love biographical minutiae, and about to produce, in James Boswell, the biographer who raised familiar biography to a plane of high art; but it is a fact. Hester therefore, under the triple incentive of Dr. Johnson's belief in the value of saving the fragments of life, Henry Thrale's indulgent expectation, and her own delight in the French anas, sat herself down to glean her wits, and to create what was almost, if not quite, the first English Ana. a collection of Hester Thrale's thoughts, experiences and verses from this period of her life. It was important because it was almost the first English Ana. 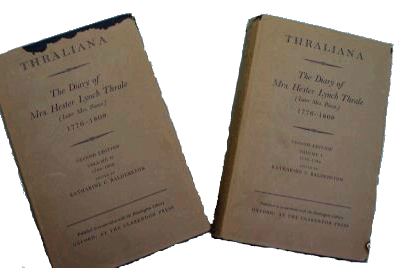 Thraliana is a collection of Hester Lynch Thrale's thoughts, experiences and some of her verses from this period of her life. It is filled with detailed accounts of domestic politics, the French Revolution, cameo portraits of friends and enemies as well as Latin epigrams, gossip, poetry and such fascinating details as the price of a shirt in 1801, shedding a powerful beam of light on the life and culture of Georgian England. Thraliana is itself an odd Thing! here is the Year 1791 begun, and five Volumes of the six Mr Thrale gave me, not filled yet3:-- very strange! considering what Trash I put in it too. but when the last comes as near to ending as this now does--my fingers will shake lest I should be near ending as well as my Book. my heart tells me that he said something when he presented me with the Volumes, as if--I don't know as if: but this I know, that fifteen Years have elapsed since I first made the Thraliana my Confident, my solitary Comfort, and Depositary of every Thought as it arose. What will be done with my poor Thraliana when I am dead? I hope the Day is distant however, and as Old Kecksey says--Who's afraid? Let it Never be printed! oh never, never never. Revisal of ones past life!! Doctor Johnson who always profess'd an Aversion to Canting … did not surely cant himself when he advised me to keep a Register of Events, Conversations &, and said how pleasant it would be in Revisal! and I stupid Dunce! never had the Wit to reply 'Why Sir, you don't like reviewing your own Life; why should I at your Age like it better?' he always said looking back on past Days was dreadful to him: & then counseled me to make a 'Thraliana'. I have looked into mine since I brought it from Brynbella--read 12 Pages--and lost my sleep for a Week. Nothing should keep me from burning the whole to Night, but respect for my Executor's Profit or Amusement--but I have tied it up tight, & will review my past Life no more. After her death the volumes which had been the subject of so much heart-searching became the property of her heir, Sir John Salusbury Piozzi Salusbury, and remained in the possession of his family until 1922, first passing to his son, the Rev. George Augustus Salusbury, and from him in turn to his son, Major Edward Pemberton Salusbury. The latter offered them for sale at Sotheby's, in June 1908, along with a large collection of other manuscripts from the Piozzian archives, but bought them in again, presumably for lack of a satisfactory bid. Major Pemberton died in 1908, and his daughter, Mrs. R. V. Colman, of Denbigh, again offered the volumes for sale in 1920. They were finally sold by private treaty in 1922 to Mr. Henry E. Huntington, through his librarian, Mr. George Watson Cole, and have reached their current home in the Huntington Library, at San Marino, California. An annotated version of Thraliana was published by the Clarendon Press in 1942 and 1952, edited by Katherine C Balderston. This is in two volumes and totals over 1300 pages. 1. William Seward 1747-1799 was an anecdotist and son of a wealthy brewer of the firm Calvert and Seward. 3. This entry was made on page 204 of volume v.
A Newer Thraliana, the 2005 second family history of the Thrale family by Richard William Thrale.